The UBTER had conducted various group C Examination ( post code 252, 100 & 60 ), from 18 June 2017 to 25 June 2017 at various centres. Now UBTER Uttarakhand Board of Technical Education has issued a link for the answer keys of ubter post code 252, 100 & 60. Candidates can check their answer key and download for future references. You can also send response to doubtful question to UBTER BEFORE 20 July 2017, if there is any mismatch in the answer keys. 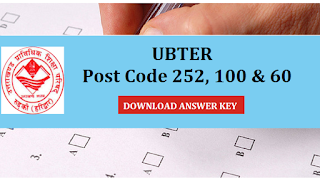 Please provide UBTER question paper code 252(shayak Librarian).